I’ve written before about my study of the Civil War. I love to combine that with my photography. Sometimes strange things happen. A couple of years ago I learned that the Civil War Trust sponsored an annual photography competition for Civil War themed photos. It included a category called “Then and Now” in which they asked for two photos to be submitted, one from a vintage photo, the other from present day taken from the same perspective. On a trip to Washington, D.C. and the Antietam National Battlefield Park a couple of years ago I decided to give it a try. I downloaded some views from the Library of Congress that I thought would work. I did a good job on finding the locations, and it was interesting, but somehow lacking. However, I submitted several entries. Nothing happened. About that same time I began to see instances of photographers holding old photos at arms length that matched the wider angle view seen in front of them. Much more whimsical. Then I discovered a number of stunning images where photographers took vintage photos and superimposed and blended them with modern day views. The first one I saw was by historical expert Jo Teeuwisse, from Amsterdam. Her images are stunning. Please view them. So on my next trip back from D.C. I stopped at Antietam again, armed with copies of the vintage photos. 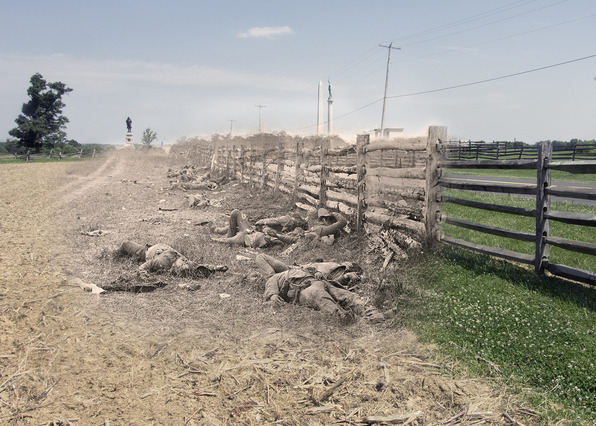 I finally settled on one scene by Alexander Gardner, showing Confederate dead along the Hagerstown Pike. From books and previous visits I knew the spot. In fact, there is a plaque near the site that shows the original photo. I made a number of images, slightly varying my focal length and position, moving front and back, left and right, up and down. In Photoshop, I took the old image, toned it and pasted it on top of the “now” photo, sized them to match and then erased around the “then” image to blend them together. I’m proud to say that I won first place in the category. There were so many quality photos. The award is registration to the 2014 Center for Civil War Photography “Image of War” seminar, to be held in Fredricksburg, VA. Can’t wait.